BRUSSELS/MADRID (Reuters) – Euro zone finance ministers agreed on Saturday to lendSpain up to 100 billion euros ($125 billion) to shore up its teetering banks and Madrid said it would specify precisely how much it needs once independent audits report in just over a week. After a 2 1/2-hour conference call of the 17 finance ministers, which several sources described as heated, the Eurogroup andMadrid said the amount of the bailout would be sufficiently large to banish any doubts. Spain said it wanted aid for its banks but would not specify the precise amount until two independent consultancies – Oliver Wyman and Roland Berger – deliver their assessment of the banking sector’s capital needs some time before June 21. 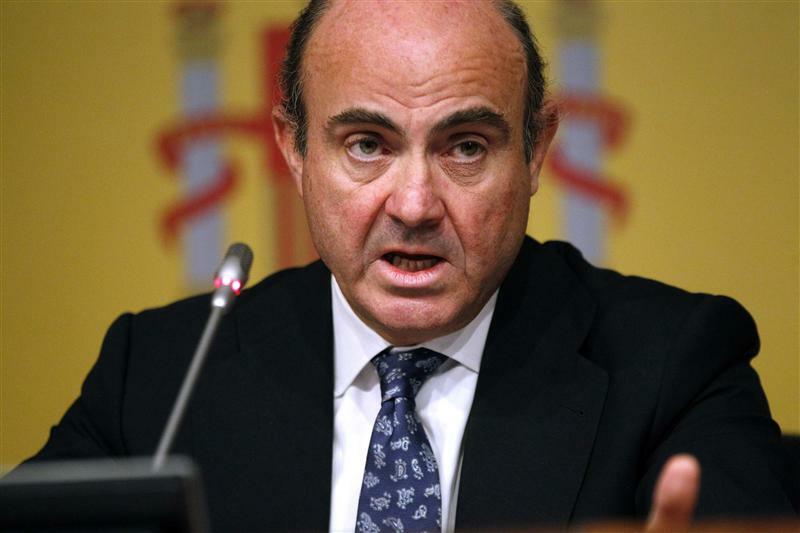 “The Spanish government declares its intention to request European financing for the recapitalization of the Spanish banks that need it,” Economy Minister Luis de Guindos said at a news conference in Madrid. He said the amounts needed would be manageable and that the funds requested would amply cover any needs. A bailout for Spain‘s banks, beset by bad debts since a property bubble burst, would make it the fourth country to seek assistance since Europe‘s debt crisis began. “These are important for the health of Spain‘s economy and as concrete steps on the path to financial union, which is vital to the resilience of the euro area,” U.S. Treasury Secretary Timothy Geithner said. Likewise, the Group of Seven developed nations – the United States, Germany, France, Britain, Italy, Japan and Canada – heralded the move as a milestone as the euro zone moves toward tighter financial and budgetary ties. Officials said there had been a heated debate over the International Monetary Fund‘s role in Spain‘s bank rescue, whichMadrid wanted kept to a minimum. The IMF will not provide any of the money. In the end it was agreed that the IMF would help monitor reforms in Spain‘s banking sector, while EU institutions would ensure Spain stuck to its broader economic commitments. Sources involved in the talks said there had been pressure on Madrid to make a precise request right away, but Spain had resisted. Euro zone policymakers are eager to shore up Spain‘s position before June 17 elections in Greece which could pushAthens closer to a euro zone exit and unleash a wave of contagion. Spain‘s auditors could report back after that date. “That’s why it’s so important that the ESM … be ratified quickly,” German Finance Minister Wolfgang Schaeuble said. The Spanish government has already spent 15 billion euros bailing out small regional savings banks that lent recklessly to property developers. Spain‘s biggest failed bank, Bankia, will cost 23.5 billion euros to rescue and its shareholders have been wiped out. The race to resolve the banks’ troubles comes after Fitch Ratings cut Madrid‘s sovereign credit rating by three notches to BBB, highlighting the Spanish banking sector’s exposure to bad property loans and to contagion from Greece‘s debt crisis. “Europe was more disappointing than we had expected, it was less capable of tackling a relatively minor problem such asGreece,” Passera told a conference on Saturday. “Since the funds being asked for are to attend to financial sector needs, the conditionality, as agreed in the Eurogroupmeeting, will be specifically for the financial sector,” de Guindos said. The Eurogroup also said money could be funneled to Spain‘s FROB bank fund although the government would “retain the full responsibility of the financial assistance”. Irish Finance Minister Michael Noonan said the funds would be provided through the EFSF or ESM at the same interest rates that apply to funds provided to other bailout countries.